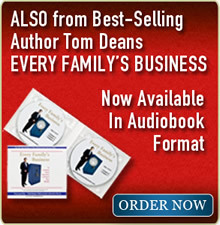 With 50% of employees dying intestate, Dr. Tom Deans shows how and why leading companies and their Human Resource professionals are investing resources today to educate employees about the importance of preparing estate plans including the writing of wills. The Willing Wisdom Keynote speech leaves employees inspired to begin conversations with their own parents and children about the division of assets, issues of Guardianship, Powers of Attorney and Advanced Health Care Directives – all issues which when left unaddressed can have devastating consequences for employees and the companies they work for. 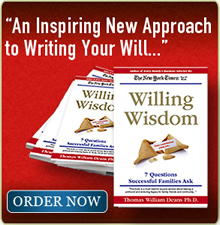 Dr. Deans shows employees how preparing a will can help them find value and purpose in the work they do everyday by living life in the service of others. His skilled use of humor, story telling and statistics leaves audiences understanding that great companies, like great families, are built purposefully over time, one conversation and relationship at a time. Themes: Themes: Themes: Building Company Culture, The Importance of Family and Friends, Estate Planning, Living a Purposeful Life, Inspiration, Aging. WHY DID YOU WRITE WILLING WISDOM?